Four months after President Trump directed NASA to return to the Moon, the agency has presented a road map to meet the goals outlined in Space Policy Directive-1. The updated plan shifts focus from the previous “Journey to Mars” campaign back to the Moon, and—eventually—to the Red Planet. “The Moon will play an important role in expanding human presence deeper into the solar system,” said Bill Gerstenmaier, associate administrator of the Human Exploration and Operations Mission Directorate at NASA, in a release issued by the agency. While the revamped plan may share the same destination as the Apollo program, NASA said it will approach the return in a more measured and sustainable manner. Unlike humanity’s first trip to the Moon, the journey back will incorporate both commercial and international partners. Transition low-Earth orbit (LEO) human spaceflight activities to commercial operators. Expand long-duration spaceflight activities to include lunar orbit. Facilitate long-term robotic lunar exploration. Use human exploration of the Moon as groundwork for eventual human missions to Mars and beyond. The objectives for low-Earth orbit include the ending of direct support for the International Space Station by 2025. To achieve this, NASA said it will work with its international and commercial partners to develop a plan to shift station operations from its current design to a non-NASA operating model. To replace the decreased support from NASA, the agency proposes to open up station visits to more international astronauts and expend partnerships to new nations. Additionally, NASA seeks to expand commercial participation on the station through public-private partnerships designed to enable new space-based products and services. The outpost, which saw its first component launched in November 1998, costs NASA approximately $3 billion per year to maintain. Though it’s unclear how that funding will be used after 2024, it would be logical to assume that money could be shifted to other programs in support of the lunar, and deep space, exploration programs. Though the agency’s sights have been shifted from Mars to the Moon, NASA’s super-heavy-lift rocket—the Space Launch System (SLS)—will still play a key role in the lunar exploration goals. The first flight of the rocket, Exploration Mission-1 (EM-1), will take place in 2020 and send an uncrewed Orion spacecraft to the Moon. Three years later, EM-2 will see SLS send astronauts around the Moon on the first crewed flight of the spacecraft. The interregnum between the two early SLS flights will see the agency work with commercial partners to address other parts of the exploration road map, notably the construction of the Lunar Orbital Platform-Gateway (LOP-G) and support of lunar robotic exploration. NASA said it wants to have LOP-G’s power-propulsion element (PPE) delivered to lunar orbit by 2022 to serve as a nucleus to the lunar space station. Beyond serving as a core component to the nascent outpost, the PPE will host communications and high power solar electric propulsion technology. 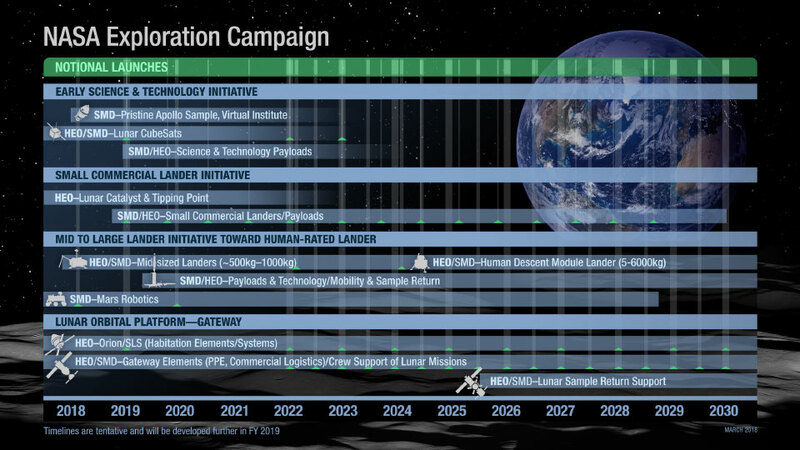 Commercial lunar robotic exploration, meanwhile, is targeted for operations no later than 2020. NASA hopes the work will progress from small, uncrewed lunar landers, to more substantial versions with the capacity to support human surface operations. Beyond those lunar-centric goals, the agency plans to maintain and grow U.S. leadership in Mars exploration, with the 2020 rover as its near-term flagship mission, culminating in the return of a surface sample from the Red Planet. 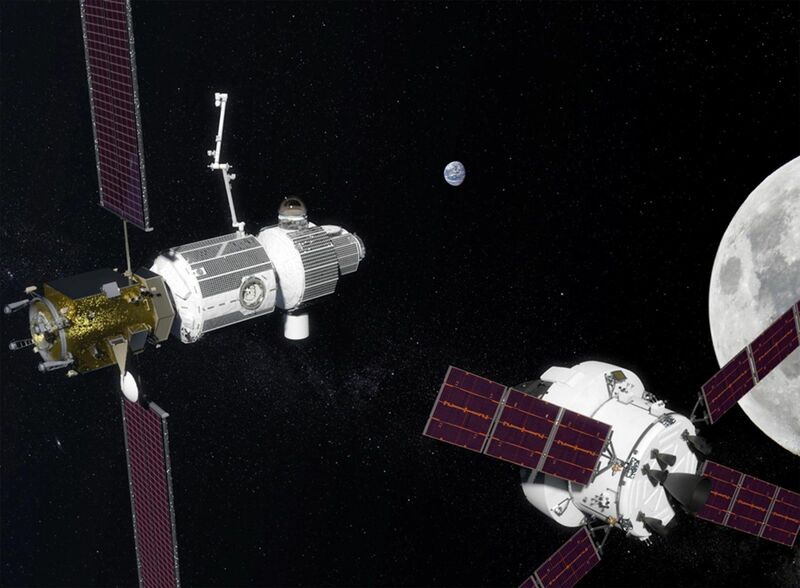 “Coupled with the capabilities enabled by the Lunar Orbital Platform-Gateway, these missions will usher in a new era of exploration of the Moon and its resources, and provide a training ground for human missions to Mars,” Gerstenmaier said. A sensible outline. I am underwhelmed. Make Robert Zubrin the head of NASA and he’ll get us to Mars in ten years. He and Musk have bypassed the constipated thinking of our current “Fearless Leader” in so many ways. Going back to the Moon for exploration is a grand idea for lunar scientists, but it will never, ever capture the imaginations of the public like a Mars Mission would! I’m sorry. Maybe we had to go at least to the moon to see if space travel was practical. Our moon trips have obviously and clearly shown that space travel FOR HUMANS over long distances and years of time without the ability to have heavy support both in numbers and wide variety all of which couldn’t be stored on a space craft when it left the earth …. have to none the less be available elsewhere to provide continuing support. Just as the early settlers who moved west had to have air water and game animals to eat. Science fiction replicators and warp speeds are just that …. NOTHING MORE. Not to mention an atmosphere AND REASONABLE TEMPERATURES that ARE readily available outside the confines of some prison structure ARE ESSENTIAL, FOR ALL HUMANS EXCEPT an occasional short term laboratory for experimentation. And putting thousands of huge things in space and saying sorry we can’t control where they fall back into the earth is not an acceptable option any more ….. the need to do so with early experiments before large extra weight could also be carried aloft …. not withstanding. Those days are now gone for ever. Please get real NASA. This Lunar Orbital Platform-Gateway would swallow time and money, and endanger astronauts, while going nowhere. If a use has to be found for the SLS, sending a large probe to Phobos to check it out for water and other resources would be more interesting and useful. The NASA LOOP-Hole in nowhere. Good for exploring nothing! NASA will be completely irrelevant for human space flight. They refuse to explore anything. They don’t even show the slightest interest in the Moon which is NASA’s great pride since Apollo. If NASA goes ahead with the SLS/Orion junk and that cis-Lunar Tollbooth capsule, NASA will never again have anything to do with either HSF or rocket development. Because others are going forward. The obviously best HSF program would be to go to the moons of Mars. Costs less than half of going to the surface of Mars and can be done early while the equipment for a surface mission is being developed. No need for EDL landing systems, no need for an ascent rocket from Mars’ gravity well, no need for a second surface habitat and so on. It would be just like a long stay on the ISS, with EVA’s to those two milligravity moons. Which are of highest scientific interest to understand the formation of the Solar system. It is still unclear whether they were captured, formed together with Mars or formed from an impact like our Moon. Terrestrial planets having moons, and Phobos will crash into Mars in only ~10 million years or less than 1% of the lifetime of Mars. A very important issue for habitability. Only challenge is spending 33 or so months in microgravity, so rotating acceleration is needed as a remedy. Should be highest priority right now to build a rotating space station in LEO as a test bed if not prototype for an Earth-Mars transfer spacecraft. A human mission to the moons of Mars could fetch the planned robotic Mars surface samples, which then only need to ascent to the low orbit of Phobos. It would be a great pathfinder, and a chunk we can bite off now thanks to the decades long experience of safety aboard the ISS. I think it would accelerate the first human mission to the surface of Mars. Click on the half-circle in the upper right. That will convert the site to one with a light background.